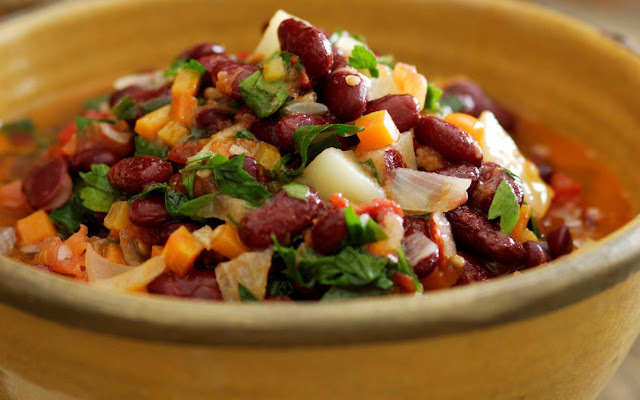 Drain soaked beans and place in a large saucepan. Cover with water. Bring to boil and cook for 1 1/2 hours, until tender but mushy. Drain beans, reserving 1 1/2 cups cooking liquid. Add juice to reserved liquid and set aside. Heat oil in a large saucepan on low. Saute onion for 5 minutes, until soft and pale golden. Add garlic, potato, chilli and carrot Cook for another 5 minutes. Stir in freshly cooked reserved liquid and tomato, or canned beans with and tomato. Season to taste and cook for another 20 minutes. Stir in parsley, reserving a little to garnish. Serve at room temperature, sprinkled with reserved parsley and drizzled with a little extra lemon juice.